Designed for superior downhill sessions as well as quick spins around town or campus the Atom 39" Cruiser Longboard is a perfect performance blend. Wide trucks and a low center of gravity let you carve deeper with more stability while solid 6" urethane wheels and optional F-series bindings allow you to take your boarding onto rougher terrain without sacrificing the mobility and style of a normal longboard. The MBS ATS trucks have been with MBS from the start. The ATS Truck System is adjustable and lightweight. Great for high speeds and on the dime turns. 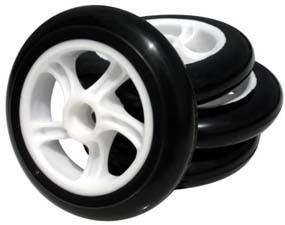 The MBS super high rebound (SHR) urethane wheels.